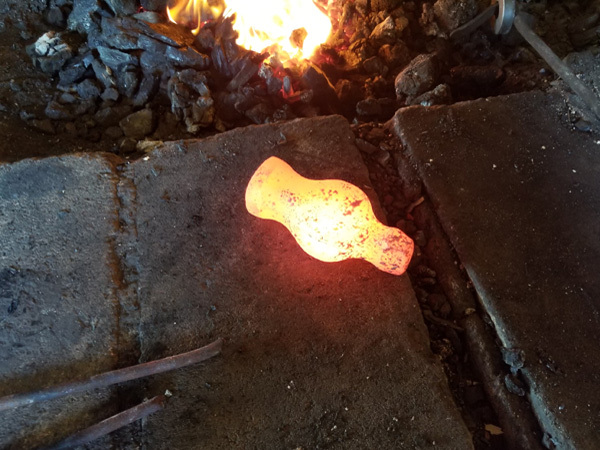 Making a diagonal peen hammer - The Iron Forge Fire Blackmithing Forum. 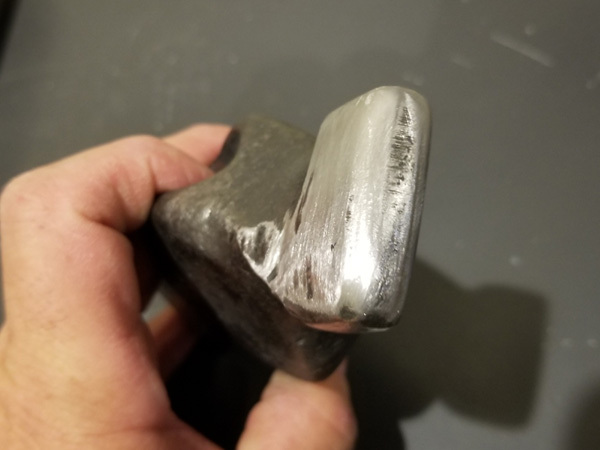 A couple of months ago a man came to a blacksmith group meeting and brought with him a hammer he forged from square bar stock. The peen had a 45 degree angle and a custom carved handle. He offered to let me try it and as soon as I did I recognized the brilliance in the diagonal peen. For those who don't know where this is going, here’s the spoiler. 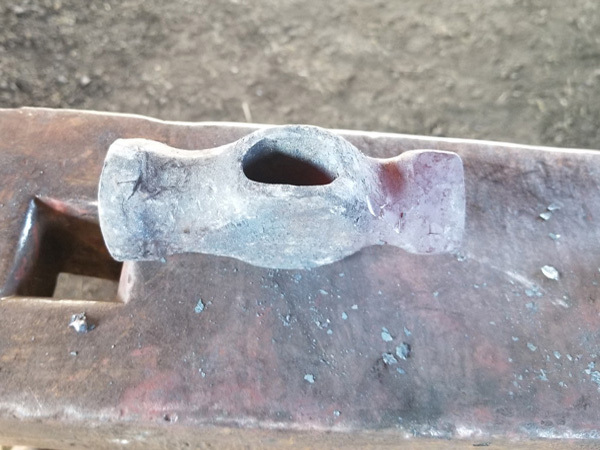 When standing at the anvil the diagonal peen aligns naturally with the edge of the anvil. Walla I had to have one. I went straight to eBay after getting home. There are a few custom hammers available in the $150.00 plus range. Well. Maybe I would bite at a hundred to 150 but, 150 plus got a little rich. I looked for a large cross peen I could customize. Score. 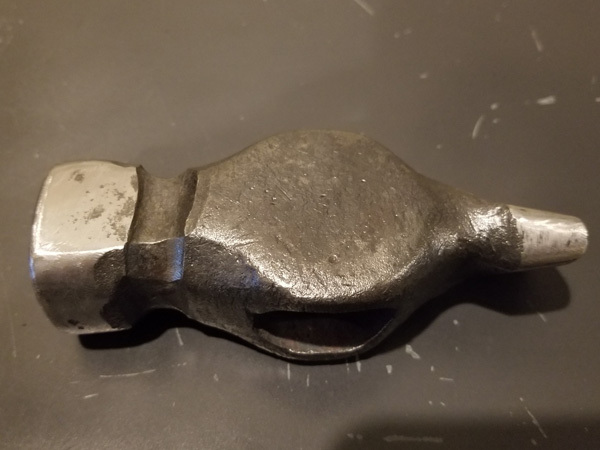 I got a well worn but intact cross peen for 25 bucks less handle. The look of it made me believe it might be 30 plus years old. Just my hunch that it wouldn’t be a junk hammer from over seas. Note, There wasn’t any maker marks on it. I tossed it in the forge twice and slowly took it up to critical temp and let it air cool. Now to start the make over. I took it to orange yellow and clamped it in the vise on the cheek just above the eye. Twisited the peen. This took a few heats to get it to the desired angle.. Then back to the fire to to fuller the neck. That was a little bit of work. In hindsight I might not do that again. To late on this project. Then I got a striker to flatten the round face on the sides making the hammer face sides even with the cheeks. That added material to the center of the face and gave it a gentle curve top to bottom. Rounded the face edges. Then cleaned up the rough areas with the grinder. Which brings up my original concern. Is the steel good quality steel. 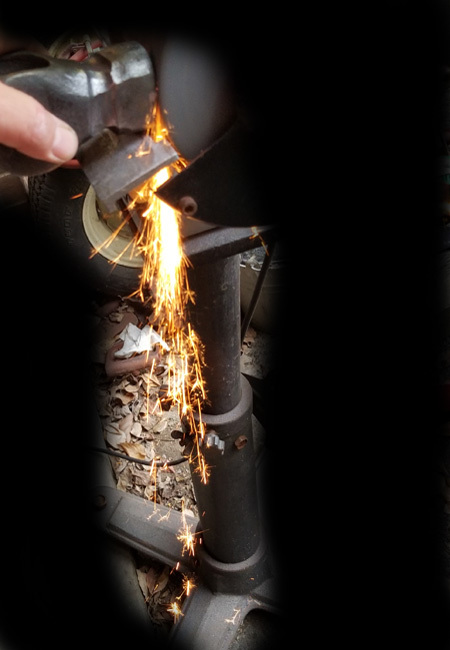 The first indication is medium carbon to high carbon steel. I need to do a little more investigation to confirm it. I do think I’ll be okay. I’ll post pics soon. I’ve been busy and have a few post to share shortly. lol, those are a nice design and a useful tool to be added to the rack. OK GUYS I deserve that. Here they are. six ounces. When I asked the clerk for clarification she just said yes. So next stop the produce stand. I took it to critical temp twice times and allowed it to air cool. Then I twisted the peen. I locked the cheeks just above the eye in the vise and used a wrench to twist the peen. I also fullered the neck. I'm ok with it I think I should have used a smaller radius fuller. I did it mostly for the sake of using the guillotine. I started to clean up the face and get rid of mushroomed areas that were originally in the face when I purchased it. You'll see my concerns in the following images. Good spark. Medium carbon steel? Looking for opinions here. I removed areas that had cracks. They existed in the areas that were mushroomed. You can see the cracks in the pic of the head sitting on the anvil. 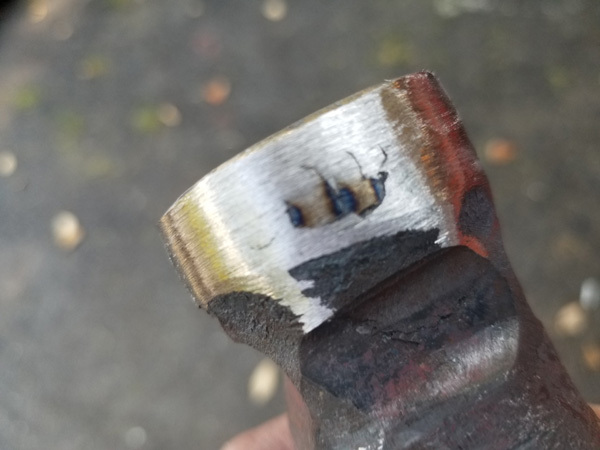 After light grinding I couldn't find any areas that looked cracked. 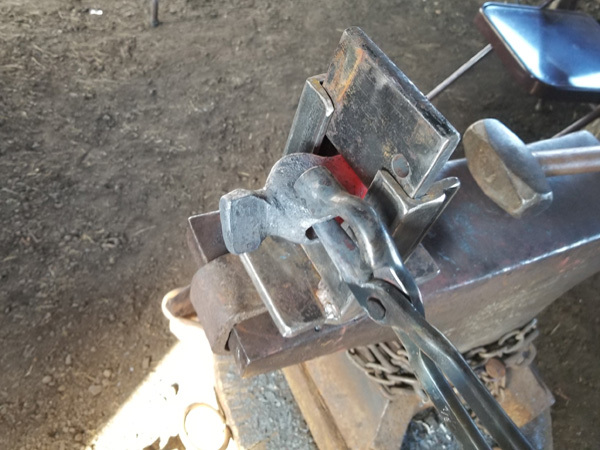 I went back to the forge and used a flatter and a striker and flattened the sides of the face even with the cheeks. Pics above and below show some file work getting the contours I like. The next time at the forge I'll add the temper to the face and peen. Both sides of the hammer. I've made one before. I made the face a little too flat so I need to modify it a bit, but it certainly has its uses. 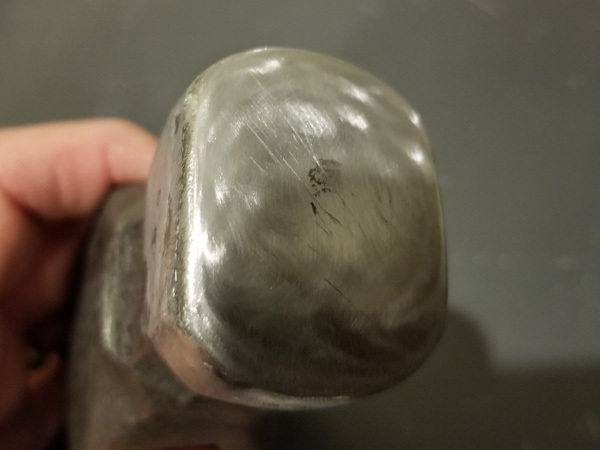 From my experience, it takes a little practice to use proficeintly (the pien at least) when you are used to a straight or cross pien hammer.